Performing "Earthsong" below a stained glass window called "Creation of Earth" in Prague. 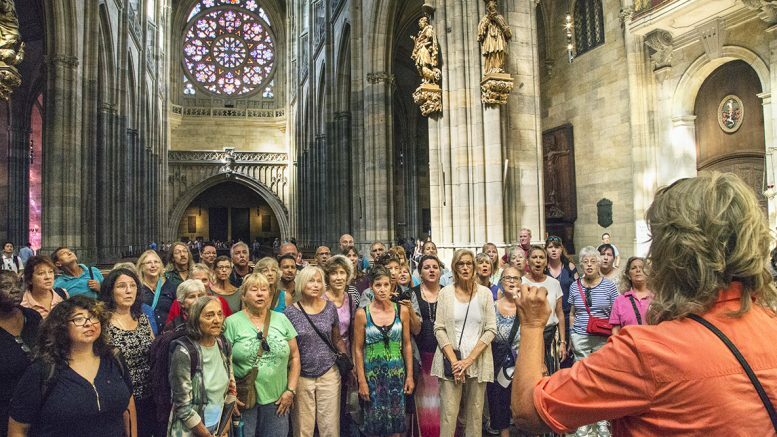 “We never actually expect our dreams to come true!” exclaimed Rafael Reynaga, talking about the moment when the New Mexico Peace Choir’s director rounded a corner in a cathedral in Prague and came face to face with a stained glass window she had dreamed about three years earlier. Many people dream of peace—but retired music teacher Christy Conduff dreamed of a peace choir. Her dream has now taken on a life of its own in an unlikely story so full of surprises no one would believe it if it were fiction. About three years ago, Conduff said she woke in the middle of the night from what she called a “technicolor dream,” covered in goosebumps and with her hair standing on end. After a career of 30 years as an elementary school music teacher, and more than 40 years directing church choirs, she had been mulling over the idea of starting some kind of choir, but wasn’t sure what form it should take. She was feeling burned out. The New Mexico Peace Choir has only been in existence for a few years, and in fact as of this writing has only performed four “actual concerts,” Conduff said. Even so, the choir has drawn large crowds for each performance. The choir has about 90 singers. The choir is neither religious or political, steering instead toward songs of kindness, connectedness, caring for the Earth, “songs that touch the heart,” Conduff said. With only a few concerts—along with some flash mobs and a performance to open the New Mexico state legislature this year—under its belt, the choir headed out to Europe to take part in the World Peace Choir Festival, held in Vienna, Austria. One of the festival’s founders was Ravi Shankar, who worked with the director of the Vienna Boys Choir, Gerald Wirth, and others to get it established. This year about 15 choirs from around the world participated, including only one from the United States, the New Mexico Peace Choir. Even that was unlikely, but organizers were willing to allow Conduff’s choir to skip some of the requirements others had to follow, like making all of the rehearsals. When they arrived they discovered that theirs was the only adult choir in the festival this year, as every other, including the Vienna Boys Choir, were made up of children, many from Asian countries. Denise Baccadutre is the Peace Choir’s accompanist, and herself was a choir teacher in Moriarty and Kansas before her retirement. She had stayed in touch with Conduff—who also taught music in the Moriarty-Edgewood schools before her retirement—and played piano for other choirs she directed. Reynaga had his own adventure in getting to Vienna. He works two jobs, and had his bag packed and in his car as he worked an overnight shift at a hotel in Albuquerque. His plan was to leave work straight for the airport. Instead, he found his car had been broken into, and his luggage, which contained both his passport and his money for the trip, had been stolen. He thought he would not be able to go, and was trying to figure out how to break the news to Conduff as he spoke with police. Meanwhile, the rest of the choir who were making the trip to Europe were at the airport, wondering where one of their basses was. Various members of the choir called and texted Reynaga from the airport as he filed his police report. Reynaga’s roommate sped him to the airport, loaded down only with a backpack with a few clothes and almost no money. He didn’t know it, but Conduff was holding the airplane on the tarmac as the choir texted and spoke with him as he approached the gate. The flight attendants were not too pleased with Conduff, who stood her ground in the loading area, waving her arms and shouting at Reynaga through the crowded airport to run. Others in the airport joined in, yelling out, “Rafa! Run! You need to run!” as his name was called out over the intercom. The plan was to get Reynaga to Atlanta, where he hoped to replace his passport in time to catch up with the group in Austria. They had taken up a collection for him on the plane, pooling together nearly $600. In Atlanta, the group took some time for a flash mob performance in the airport before they parted ways—the choir getting on an international flight, and Reynaga hoping for the best. He would either get a passport or fly back to Albuquerque the next day. Delta Airline paid for a hotel room for the night in Atlanta, and arranged a shuttle for him. He needed an appointment with the passport agency, and a recorded message told him the soonest he could get one was Aug. 4. The choir would be returning from Europe by then. The Delta employee called someone, and got him an appointment at the passport agency at 8 a.m. the following day. She gave him a toiletry kit and a food voucher. He needed a photo for his passport and asked the shuttle driver how close the nearest CVS or Walgreens was. The driver told him they were not close, but offered to drive him there anyway, waiting in the parking lot as he got the photo taken. The next morning, the hotel had a car waiting to take him to his appointment. Even at 8 a.m. there were 45 people ahead of him in line, all with lost or stolen passports. Reynaga got on a train and headed back to the airport. At the Delta counter, a woman who was scheduled to get off work in five minutes instead spent the next two hours finding connecting flights that would get him to Vienna in time for the performance. For his birthday, a few days later, the New Mexico Peace Choir sang Happy Birthday 18 times, Reynaga said. In Prague, a stop that was not on the original schedule, which instead would have taken the group to Salzburg, the choir found the stained glass window Conduff had dreamed. They were touring a castle that had St. Vitus Cathedral on its grounds, one of the oldest in the Czech Republic, built more than a thousand years ago. When Conduff saw the window, “She was very emotional,” Reynaga said. “She kind of had to collect herself. She knew. … A happiness and like a peace kind of came over her. She was meant to do that, and she got to do that,” Reynaga said. Later during the tour they learned that the name of the stained glass window is “Creation of Earth.” In her dream and on their trip, the choir sang Earthsong underneath it.